A man soaked himself in lighter fuel and threatened to set fire to the fuel turning himself into a human torch. Richard Banks was found covered in the flammable liquid and smoking a cigarette at a Blackpool address. A police officer snatched the cigarette from him preventing a possible inferno. Banks, unemployed, 30, of Bond Street, South Shore, pleaded guilty to threatening arson in a way likely to endanger life. 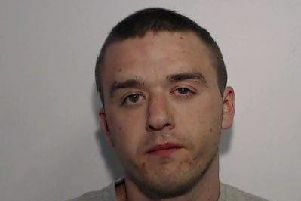 He was sentenced to 12 months community service with up to 20 days rehabilitation to be supervised by the probation service, fined £40 and ordered to pay £85 victims’ surcharge. Prosecutor, Pam Smith, said police received a report Banks had phoned their communications unit on Saturday at 4.30pm saying he had poured lighter fuel over himself and was going to set himself on fire. Officers went to Banks address, which was apartments attached to a restaurant. Banks twice refused to let police in, then unlocked the door. Police could smell a strong smell of accelerants and saw Banks covered in fuel, smoking a cigarette and surrounded by lighter fuel cans. Banks was agitated and told an officer who bravely took the cigarette off him: “I’ll do it next time. The fire brigade were called to check the address and make sure it was safe. Suzanne Mugford, defending, said her client had been suffering mental health problems recently and about a week before the offence had spent a night in hospital after threatening to harm himself. Banks admitted pouring lighter fuel on himself in the kitchen and then immediately ringing police and telling them what he had done as a cry for help. A man accused of driving with excess alcohol before crashing his Porsche Panamera 4S in St Annes has had his case mentioned at court. Adam Latham, 42, of Preston New Road, Blackpool, is charged with driving with 56 microgrammes of alcohol in his body - the legal limit is 35 - on November 8 last year. He is also alleged to have failed to have stopped and provided his name and address after crashing on St Annes Road East causing damage to property. Latham’s case was adjourned to fix a trial date by Blackpool magistrates. A man repeatedly breached his bail when he travelled to visit his family and returned home late to his address. Jordan Kealey, 22, of Springfield Road, North Shore, pleaded guilty to failing to comply with a curfew. Blackpool magistrates agreed to rebail him and extended the time of his curfew to between 9pm and 7am so he could visit family. Prosecutor, Pam Smith, said Kealey had denied allegations of wasting police time, malicious communication and obstructing the highway and been bailed for trial. He was bailed on the conditions he lived at his given address and kept a curfew there between 7pm and 7am. On four occasions in September he failed to be inside his address when his curfew started. Paul Huxley, defending, said his client had mental health issues and lived in supported housing. His family lived in the Leyland area but no supported accommodation was available there at the time and Kealey felt isolated in Blackpool. Kealey’ medication was being changed to help with his mental health problems and he often got up in the afternoon. He would then get a bus to see his family and was often late back for his curfew. A man accused of flinging his girlfriend around like a rag doll has made his first appearance at court. Darrell Pell is alleged to have hurled the young mother around the kitchen of her home into the fridge-freezer and cupboards. Pell, a 33-year-old forklift truck driver, of Westbank Avenue, Marton, pleaded not guilty to assault. The prosecutor opposed a bail application for Pell by defence lawyer Brett Chappell. Pell was bailed for trial on December 21. He must live at his given address, keep an 8pm to 5am tagged curfew and not contact the complainant or enter Highbank Avenue, Marton, as conditions of his bail.